Successfully capable of shredding 10-12 sheets at a time, the MBM 4005 SMC shredder is ideal for small scale shredding projects at the work place. With a shredding speed of 44 fpm, this shredder is a fast operating machine. The MBM Destroyit 4005 SMC High Security Shredder is a powerful shredder that gives top priority to the users' confidentiality. Achieving a premium level 6 (P-7) of security, the 4005 SMC cuts sheets into super-micro cut particles of 1/32" x 3/16" cut size. In the contemporary business world, it is essential to protect crucial information in order to avoid identity theft or loss of critical documents. 4005 SMC High Security Shredder plays a vital role in ensuring safety of important documents and user privacy. 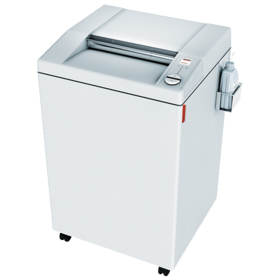 The built-in 16" feed opening allows the user to simply shred larger media like letters as well as legal documents. The spacious 44 gallon bin permits the user to empty it effortlessly when needed as it does not need to be emptied on regular basis, keeping the worry off of the users mind. The MBM Destroyit 4005 SMC High Security Shredder is further facilitated by a combination of supreme features that work in collaboration to deliver an exceptional experience of using this shredder. The solid steel cutting shafts exhibit top-of-the-line performance and are warranted for life. The easy switch multifunctional control tab uses visual signals to indicate operational status, providing a user-friendly process. Additionally, the safe shredding element is reinforced by the built-in transparent plastic cover near the shredding shafts. The patented ECC keeps track of the sheet capacity levels in order to prevent jams. Ensuring optimal performance, the MBM Destroyit 4005 SMC High Security Shredder automatically lubricates its cylinders while shredding. In conclusion, this super micro-cut shredder is best suited for work places that demand security of information and convenient processes. Cut Size 1/32 x 3/16"
Dimension 23 1/4" x 25 1/4" x 39 3/4"